Avtrade is pleased to announce a successful exhibition at MRO Middle East 2016 held at Dubai World Trade Centre. Staff greeted many customers where new business opportunities were explored and excellent feedback was received by all. 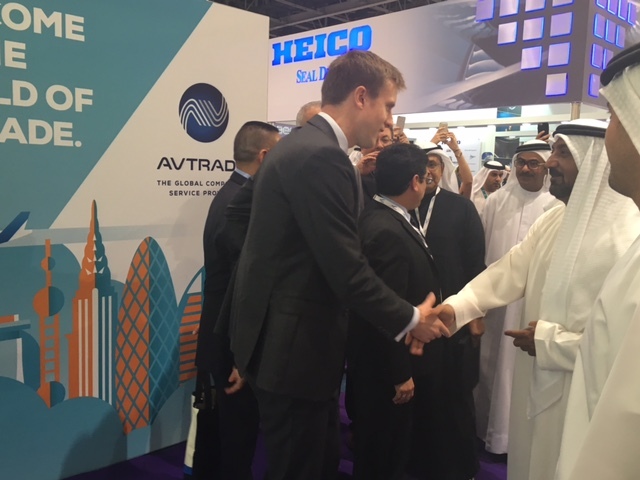 Avtrade were once again privileged to welcome His Highness Sheikh Ahmed Bin Saeed Al Maktoum to the stand. Son of the former ruler of Dubai, Chairman and Chief Executive of the Emirates Airline & Group and President of Dubai Civil Aviation Authority, Sheikh Ahmed has been influential in not only the growth of Emirates Airlines but in transforming Dubai into one of the world’s most important aviation hubs. Greeted by Aymeric de Warren, Regional Sales Director – Dubai, Avtrade were honoured by his visit. Avtrade would like to thank all customers and visitors who joined us on our stand.